May 6, 2014 - In order to go beyond certification requirements and testing to the extremes the first ever Airbus A350 XWB to visit the United States, MSN 2 (manufacturer’s serial number) has arrived at McKinley Climatic Lab at Eglin Air Force base in northwest Florida. Over the next couple of weeks the aircraft and its various systems and cabin installations will be subjected to the extreme hot and cold temperatures that the unique facility can sustain in a testing environment. These tests come on top of those already performed earlier this year in the Middle East and Northern Canada to ensure maturity and full in-service readiness from Day 1 for all A350 XWB’s operators. The Airbus A350 XWB is a family of long-range, two-engined wide-body jet airliners developed by European aircraft manufacturer Airbus. 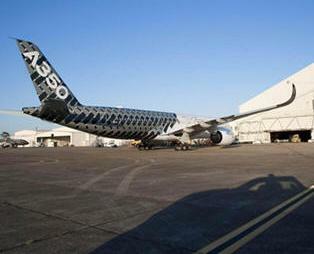 The A350 is the first Airbus with both fuselage and wing structures made primarily of carbon-fiber-reinforced polymer. It can carry 250 to 350 passengers in a typical three-class seating layout, or maximum seating of 440 to 550 passengers, depending on variant. The A350 was originally conceived in 2004 as a largely new design, but with a fuselage based on the A330. This was rejected by some prospective customers. In 2006, Airbus redesigned the aircraft and renamed it the A350 XWB (extra wide body). Airbus stated that it will be more fuel-efficient and have operating costs up to 8% lower than the competing Boeing 787 Dreamliner. There are currently four test aircraft flying in the A350 XWB program. Together they have accumulated around 1,600 flight test hours in more than 350 flights. The certification process for the program is progressing on schedule, certification is anticipated in the third quarter of 2014 with entry into service in the fourth quarter of this year. What’s Powering the World’s Best Selling Plane?